Now that the School Cliff is so clear, the task is to address and reverse it. From lists of ideas for promoting lifelong learning in one’s children to the research undertaken by the Lifelong Kindergarten project at MIT, professionals and parents are paying more and more attention to learning throughout life. Are there reliable methods for sowing seeds of lifelong learning in children? 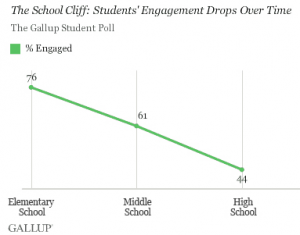 When does the natural engagement in active learning give way to disengagement? How do we inspire busy adults, or the elderly, to remain engaged in active learning? What role might children play in that process? In addition to increased interest in Montessori education, many who grapple with these questions gravitate to the Maker Movement which emphasizes the benefits of hands-on activities for children and adults. 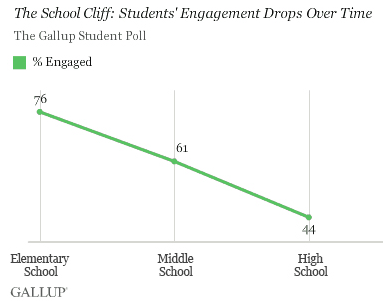 Others examine the roots of disengagement, attempting to understand when and why engagement diminishes. All this research and activity may yet result in great changes in the way we set children up for lifelong learning. But there is something we can all do, right now, that may be even more powerful: let children see us learning. In an essay written for parents as well as educators and administrators, Scott McLeod, a professor at Iowa State University, makes the case for consciously modeling the learning process for children. How many of us stand up in front of kids and say, “This is what I’m learning right now. I’m not any good at the moment but this is the process I’m following and this is what my plan is for achieving success. And I’ll give you an update in a few weeks, and then another few weeks, and so on, about how I’m doing?” How many of us purposefully and explicitly show our students what it means to struggle with learning, overcome obstacles, and emerge on the other side more skilled and more knowledgeable than we were before? You already know the answer: nearly zero. Children love observing a process. This pleasure is magnified when the process — the false starts, the realignments, and the pride of accomplishment — is enacted by an admired adult. A teacher arrives at school one day with a strange instrument, an instrument he or she has no idea how to play. In the weeks and months that follow, for five minutes a day, the children have a chance to see how the learning is progressing. A father teaches himself to knit, or to build a table, using internet videos. A mother learns a new language, or invents a complex game. Whatever the process, making it visible for children helps them to see adults as learners rather than “knowers”, inspiring even the youngest among them to learn and practice in pursuit of joy and improvement, a sure path to lifelong learning.